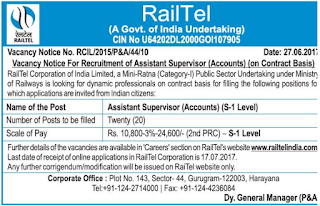 RAILTEL (RailTel Corporation of India Limited) has recently Declared a Recruitment Positions For 20 Assistant Supervisor Posts. If You are Interested In this Recruitment Positions then you can Apply for this Recruitment Online On Or Before 17-07-2017 (17th July 2017). 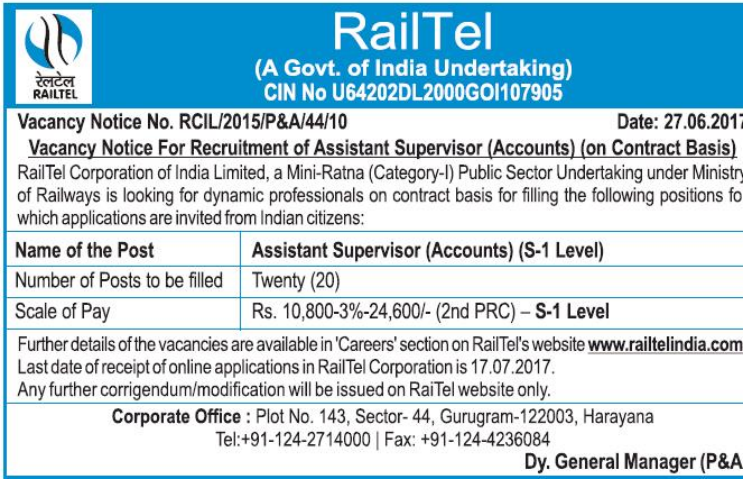 If you want to check the other Informations RAILTEL (RailTel Corporation of India Limited) Recruitment 2017 – 20 Assistant Supervisor for these Posts Like Age limit, Way of Selection, Exam Pattern, its Syllabus, Education Qualification, then please complete Information to the end. Pay Scale – Rs. 10,800 – 24,600/- . How To Apply – All the Candidates, who were going to apply for this vancacy/Recruitment, they should fill his/her Online Form by the Official Websitehttp://www.railtelindia.com before or on 17th July 2017. Last Date To Apply Online Is : 17-07-2017.